Christmas, 1910. Merinda Herringford and Jem Watts would be enjoying the season a lot more if they weren’t forced to do their own laundry and cooking. Just as they are adapting to their trusty housekeeper’s ill-timed vacation, they are confronted by the strangest mystery they’ve encountered since they started their private investigation firm. This story? These characters? Brilliant! It’s been a while, but back when I was in high school, I read every Sherlock Holmes story I could get my hands on. In this novella-length introduction to the new Herringford and Watts mystery series, Rachel McMillan does an amazing job evoking the tone and style of Doyle’s famous detective series, while making the story and characters her own. Merinda and Jem are lively and engaging characters I look forward to revisiting again and again. I love the bits of wit interjected, even in less-than-whimsical situations. I love the way the various plot threads come together and blend into a single cohesive story. And my favorite scene by far is the one with the snow, with its hints of romance to come. Being both short and intricate, the story feels told at something of a brisk clip, relying on summary at points to whisk us from one important moment to another, much as Doyle’s stories do. But the details included are well-chosen and evocative, resulting in a beautifully told story. After reading A Singular and Whimsical Problem, I can’t wait to read The Bachelor Girl’s Guide to Murder when it releases in March. And maybe I’ll have to go back and revisit some of my favorite Sherlock Holmes stories in the meantime…. Highly recommended for fans of cozy mysteries in general and Sherlock Holmes stories in particular. The monthly “Three for the Books” post is where I feature new (Hot Off the Presses), best selling (Topping the Charts), and award winning (Cream of the Crop) Christian fiction books. I select one title to feature in each category, as well as providing links to where you can browse additional newly released, best selling, and award winning titles. Have you read any of these featured titles? Any others you’d like to give a shout-out? Comments are always welcome! Merchant of Alyss by Thomas Locke (a pseudonym for Davis Bunn) released this month from Revell. It’s second in the Legends of the Realm fantasy series, following Emissary (see my review). Available in print and electronic editions. 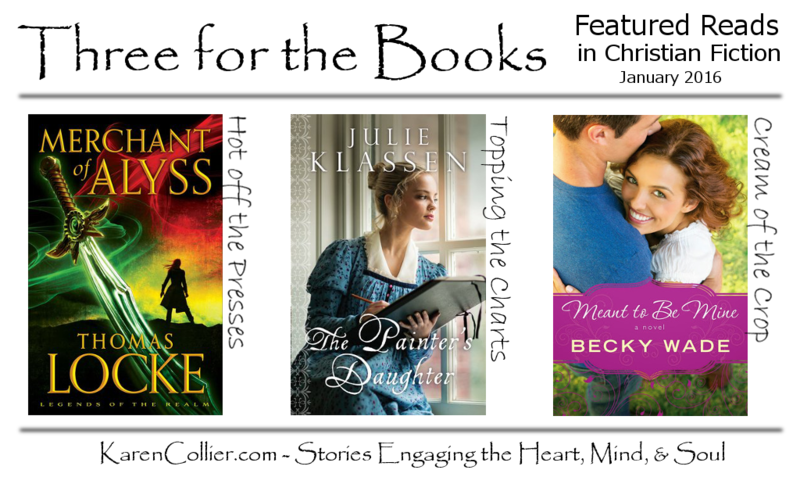 The Painter’s Daughter by Julie Klassen appears on the January ECPA Best Sellers list. It’s a regency era romance published by Bethany House, and is available in print, electronic, and audio editions. Meant to Be Mine by Becky Wade won the 2015 INSPY Award in the Contemporary Romance category. Published by Bethany House, it’s available in print, electronic, and audio editions. Prince Stephen of Brighton is one of the world’s most eligible bachelors and a star rugby player, trying to make sense of his life. His days in Afghanistan with the Royal Air Command will mark him forever. And he can’t seem to shake their dark shadow. With a little heavenly help, Prince Stephen and Corina embark on a journey of truth. But when the secrets are revealed, can they overcome and find love again? After having enjoyed the audio editions of Once Upon a Prince and Princess Ever After as much as I did, I wasn’t about to miss out on listening to How to Catch a Prince, the third book in Rachel Hauck’s Royal Wedding series. I’m pleased to say, it lived up to my expectations, and I’m happy to recommend it. Like the others in this series, How to Catch a Prince has a fairytale feel to it and features a romance plotline revolving around the fictional country of Brighton and its monarchy. But in keeping with what I’ve loved about this series so far, the story, characters, and themes in this installment were unique from those that came before. This installment features Prince Stephen, a hero we’ve met before, and American heiress Corina Del Rey. Unlike in the earlier books, this romantic couple has a past, one with a lot of emotional baggage that has to be dealt with before they can find their happily ever after. And the theme centers on what it means to love well. I found the main characters likeable, engaging, and well suited to each other. And the secondary characters were vividly portrayed. Gigi, Adelaide, Brill, and Clive Boston each added something special to the story with their unique personalities and quirks. And the Madeline and Hyacinth show with its hashtag, #HowToCatchAPrince was highly entertaining. Overall, a fun read with a worthwhile message. Eleni Pappageorge ranks among my all-time favorite audiobook narrators. She has an amazing variety of vocal qualities she can employ to give each character a unique voice that is perfectly suited to his or her character. And I love how she injects feeling into her readings through intonation and varied pacing in dialogue and narration. Both British and southern accents are well done and varied from character to character. Let’s just say, if in doubt, the audio edition is the way to go. I could listen to these stories again and again. Thank you to Oasis Audio for providing an electronic copy of this audiobook for review purposes. Wishing a belated Happy New Year to everyone here! I’m just recently back from vacationing with the family at Disney World (So much fun! Such lovely weather! ), and just starting to get back into the swing of blogging and everyday life in general. So this post may be running a bit later than similar posts at other blogs. Nevertheless, may I share with you a few of my favorite reads from 2015? This is a contemporary story full of raw honesty, brokenness, grace, and hope. It’s about two half-sisters discovering what’s worth fighting for, and it’s told from their distinctive first person viewpoints. I read this Civil War era historical for an ACFW Book Club discussion and was blown away by the vivid and sometimes surprising historical details, complex characters, and page-turning premise. Watch for my full review coming to the blog soon. This second installment in Heather Day Gilbert’s A Murder in the Mountains series delivers a contemporary amateur sleuthing mystery set in West Virginia. First person narration by a spunky heroine, draws the reader into the story. This novella does a brilliant job evoking the tone and style of Sir Arthur Conan Doyle’s classic detective series, while introducing the female detective duo starring in the new Herringford and Watts mystery series. My review coming soon. Here’s a romantic suspense novel with lots to love – witty banter, sigh-worthy romantic moments, great descriptions, and a suspenseful storyline to draw you in and keep you engaged. This historical romance is a tale of healing, redemption, mystery, suspense, and of course, love. The characters and their situations tugged on my heartstrings in a big way, making the resolution all the more beautiful. This first book in the new Summer Harbor series is a sweet contemporary romance with substance. It also features some suspenseful plot twists later in the book, for those who like suspense with their romance. Here’s the third contemporary fairytale style romance in Rachel Hauck’s Royal Wedding Series. It’s a fun story, with an amazing audio edition read by Eleni Pappageorge. My review of the audiobook is coming soon. This is book 2 in a series you kind of have to start with book 1. But it’s so fascinating! What if Christianity as we know it was illegal, replaced by a state religion? This final installment in the Eyes of E’veria fantasy series is packed full of action, adventure, romance, witty banter, and a unique blend of clever piratey justice. I love this series! Great for YA or adult readers. A fascinating tale of epic adventure, romance and political intrigue that draws the reader in to the life and times of Jesus, primarily from the viewpoint of a Bedouin woman who follows His teachings. This techno-thriller is written in the style of many New York Times bestsellers with short action-packed chapters and the kind of direct prose that cuts straight to the point. The premise caught my attention and the storytelling kept me turning the pages. Review to come. Want to discover even more great reads of the year? Check out these lists of favorites from a few of my favorite book bloggers: Books and Beverages, Bookshelves and Windows, By the Book, Dreaming Under the Same Moon, Flowers of Quiet Happiness, The Green Mockingbird, Relz Reviewz, and Seasons of Humility. What about you? What were your favorite reads of 2015? 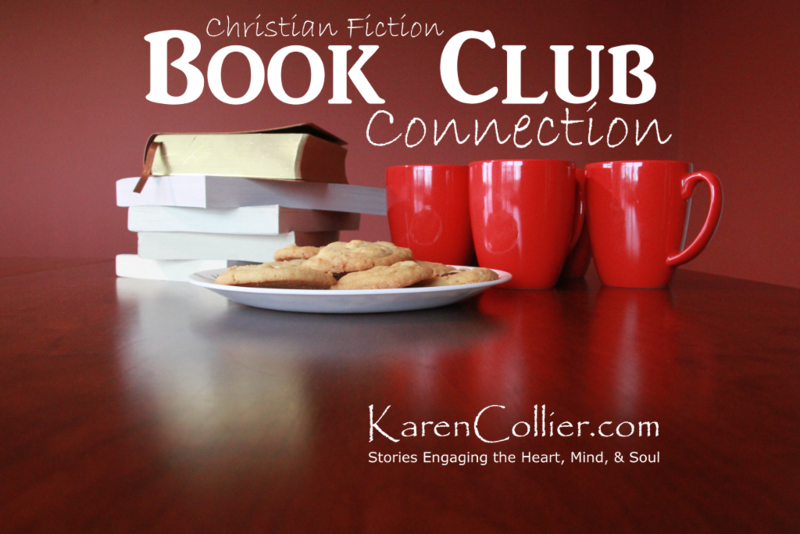 Welcome to the January 2016 edition of the Christian Fiction Book Club Connection. Thanks for stopping by! Whether you’re a pastor or ministry leader thinking of forming a book discussion group at your church, a current member of a book club, or simply a fan of Christian fiction hoping to connect with other readers, you’re in the right place. Please consider subscribing to my blog so you won’t miss future posts. The ACFW Book Club‘s January selection is Through Waters Deep by Sarah Sundin. You can subscribe to the group’s e-mail list now, by following the instructions on their Web site, to be sure not to miss any announcements or discussion questions. For January, the Christian Fiction Devourers group on Goodreads is discussing The Story Keeper by Lisa Wingate AND Lady Maybe by Julie Klassen. Grab your copies and head on over to the discussion forum to check in with others who are in the midst of reading these books. The Fans of Amish Fiction Goodreads group discusses one Amish fiction title and one Christian fiction title per month. The selections for January are Change of Heart by Molly Jebber AND A Passion Most Pure by Julie Lessman. To join in, visit the group’s online discussion board. Jamie of the Books and Beverages blog hosts a monthly Inklings discussion series for fans of J.R.R. Tolkien and C.S. Lewis. Sometimes fiction, sometimes non-fiction, the title for the month of January is the second half of The Silmarillion by J.R.R. Tolkien, continuing the discussion from December. The Cherished Book Club, the Christian Fiction Book Club, and the Fans of Christian Romance Goodreads group are taking breaks from discussion for the time being.